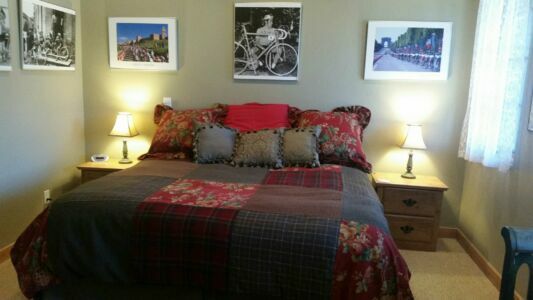 Master Suite – King bed, gas fireplace, jetted tub, 3 bedrooms with queens, loft with 1 queen and a single. A three-level, 4 bedroom plus loft, 5 bath home with ski-in/ski-out access to the Natawista Run of Moon Light Basin, Big Sky. Cowboy Heaven is a beautiful, three-level home with 2,610 square feet of living space to accommodate 11 guests. 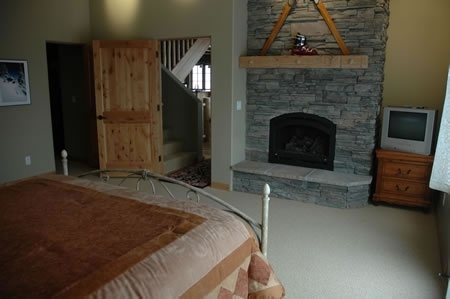 This new 4 bedroom plus loft, 5 bath mountain home is situated next to a ski trail and comes complete with grand views from the living room’s large picturesque windows. 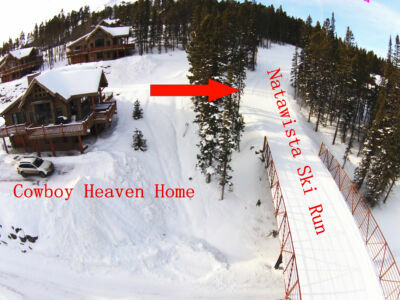 Cowboy Heaven offers true ski-in/ski-out access to the Natawista Run. Two chairlifts are accessible from the home’s location, including Derringer, and Six Shooter. With several amenities to make your stay as comfortable as can be, and just minutes from shopping and restaurants in Big Sky Mountain Village, this is the perfect home for your mountain retreat. Solid wood flooring in kitchen and living area, Mud room with ample storage for skis, equipment and boot dryer, Hot water radiant heat throughout, washer and dryer, limited ski wear, toiletries, kitchen spices, bathrobes, slippers, hairdryers, boot & glove dryer and ample ski clothing racks, no garage, parking for 4 cars. 4 wheel drive vehicles required in winter because of snow conditions. 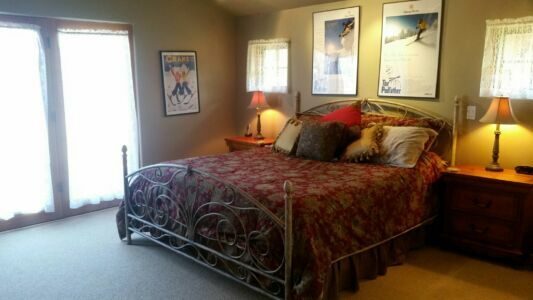 Fully equipped, deluxe kitchen with granite counter tops and stainless steel appliances, Dining Room seats 12, why not bring home a ski instructor to dinner. 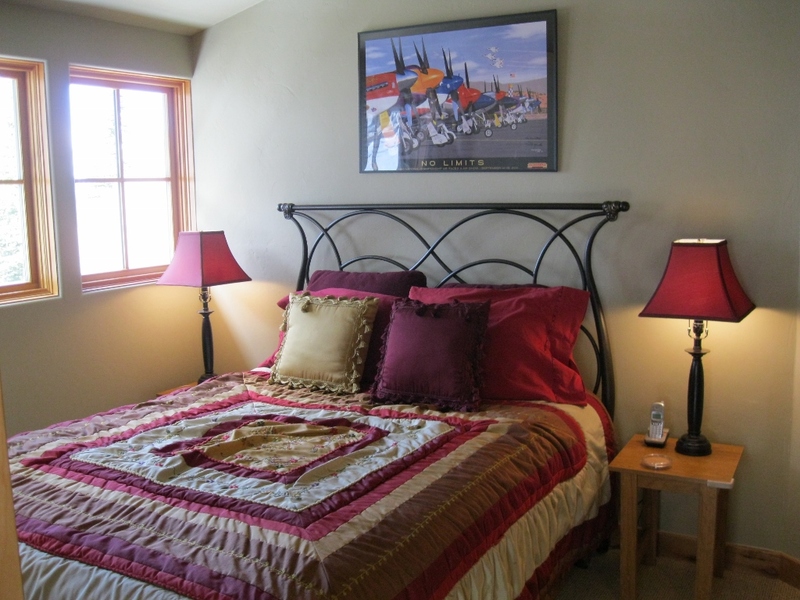 Fly Fishing, Hiking, Photo Safari’s and Scenic Photo opportunities, Golfing, Water Rafting, Horse back riding, Canoeing, Skiing, Snowmobiling (From Big Sky, or West Yellowstone) Cross Country Skiing, Snowshoeing, Sleigh rides available at Big Sky, Dog sledding. 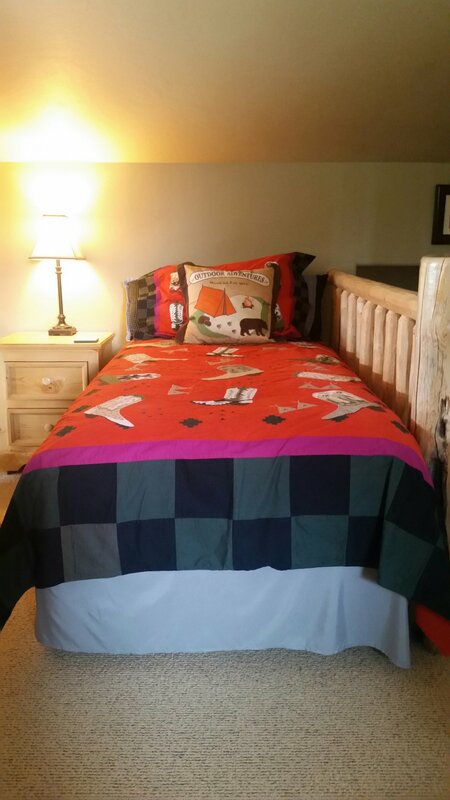 We have 1 king size bed, 4 queen size beds, and 1 single size bed. The Natawista Ski Run is right next to the house. 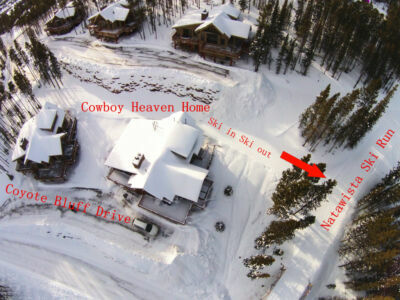 From the house back door to ski run is about 50 feet….the area is groomed. You may park on the area in front of the home and in front of the garage. You cannot park in the garage. A maximum of 3 cars can park on the property. How far is it to restaurants? This home is amazing. We had a great time. All we had to do to ski was pull our boots off the boot warmers and walk out the door and there was the ski run. The movie was excellent as they had a great collection of movies. The kitchen had everything we need to cook or make for our group. The views were spectacular. This place is a great deal. We loved this little slice of heaven. 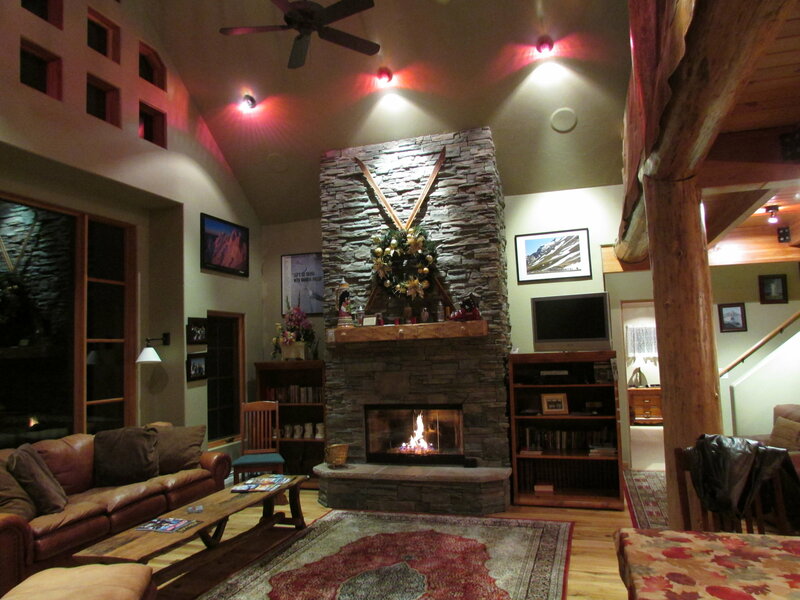 We stayed at Cowboy Heaven during the holidays and were amazed at the ease of everything! 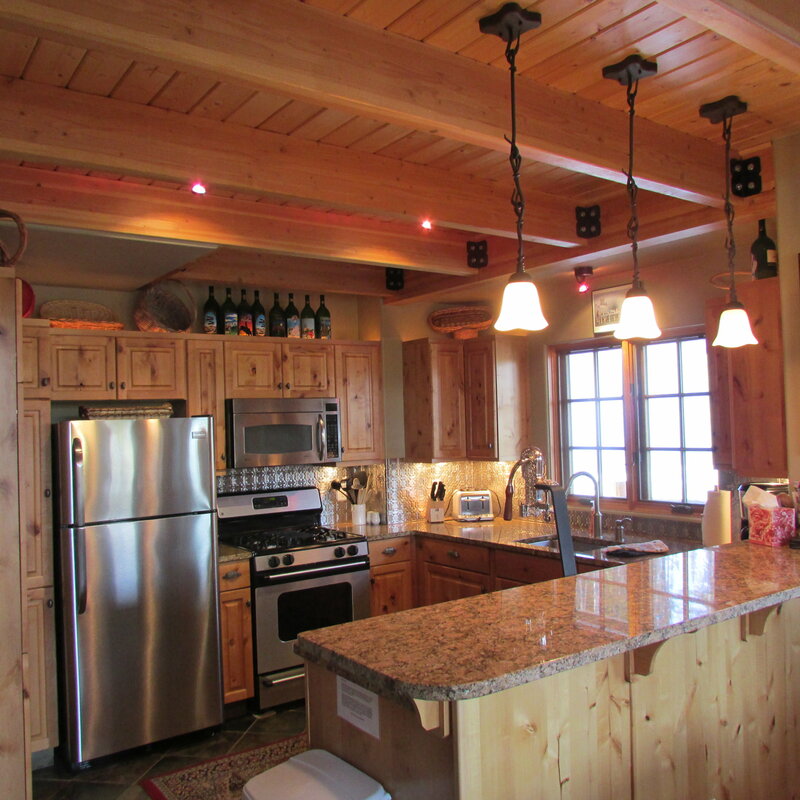 Ski in/out was fabulous access; the large well equiped kitchen/eating area was perfect for our family; and the hot tub was enjoyed by all! Beth and Buzz were wonderful at checking to see if all was going well during our stay and quick to help us in any way possible. We will definately return! Ellen did a great job of helping arrange our stay. The home was well stocked with cookware and linens. 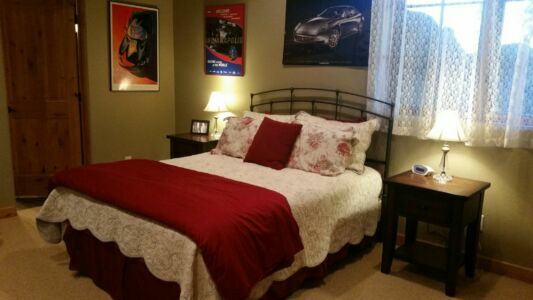 It was very clean and comfortable, and it was great that is was essentially 4 master bedrooms and loft space. The Jacuzzi worked well and well maintained. The movie room was an unexpected treat. Views from the balcony and hot tub were excellent. We took advantage of the activities around Big Sky and did rafting, ziplining, horseback riding, flyfishing,and archery. We also took several day trips to Yellowstone. The only things that were disappointing was the Yellowstone Club was not open during our stay, and the garbage pickup service did not occur during our stay. I contacted the number listed by the kitchen trash and it was outdated, so we ended up taking it ourselves to the trash/recycling center. Also the gas grill worked well, but had not been cleaned prior to our visit. I cleaned it after use to keep the bears out of the hottub :-). Not big deals but a little irritating. So glad we found this property. It was amazing and the skiing was unparalled. 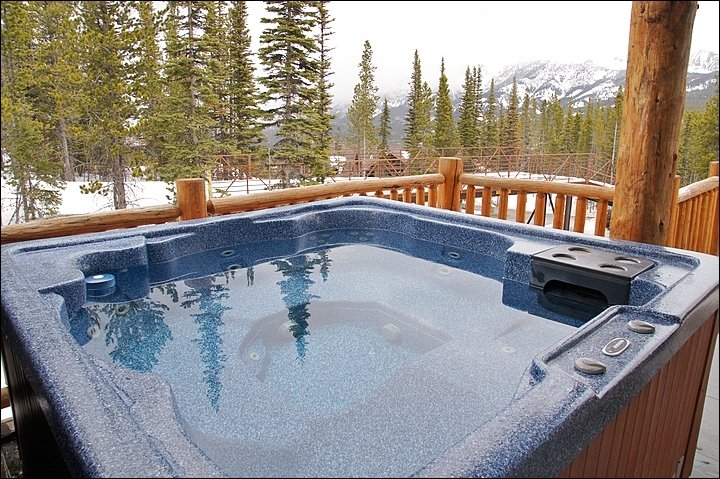 The hot tub was great after all that fresh powder. The home was nicely appointed, very relaxing, and even had a movie room. We plan on returning next year. Thanks RM Vacation Homes! What a great stay! Wonderful home with everything we could want or need! Included lots of new snow. We had a Thanksgiving with friends we will never forget. Thanks for your generosity and excellent location. 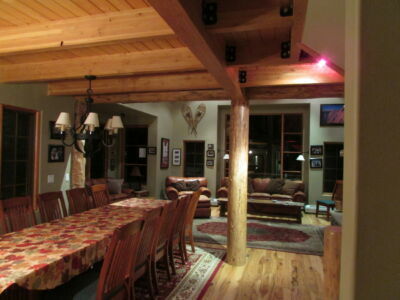 This was a great house for our group of 10 adults. We were all very comfortable with our rooms and the loft with its own bath. Wonderful kitchen for the cooks. 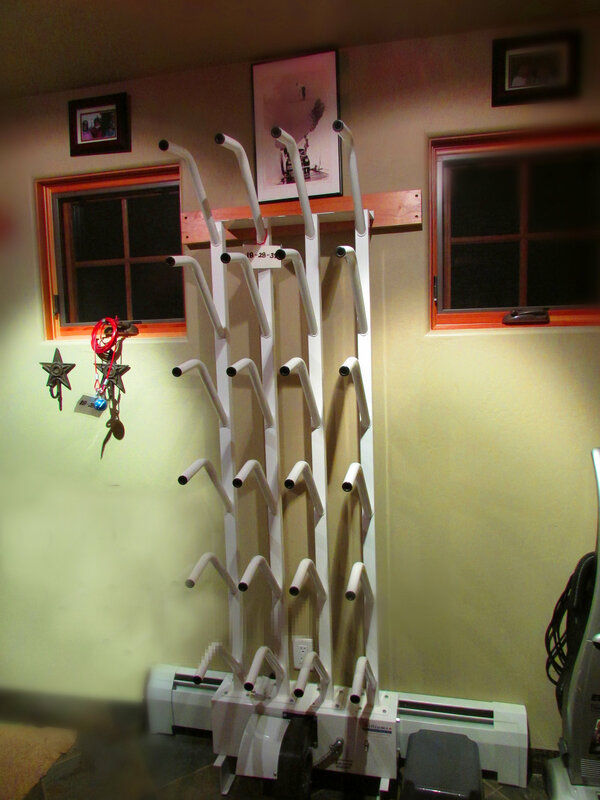 We got our use out of the hot tub and the theater room. We had unbelievable snow conditions and the ski in and out was excellent. We can not wait to get back here. What a wonderful way to spread Christmas cheer with our family! Couldn’t have been better! The house was great---very well equipped. We really enjoyed the hot tub, the fire place, the home theatre, and, more than anything, the wonderful location with magnificent views. Ski-in/ski-out was great, and we had a lot of snow which was also perfect! We really hope to be back. We truly love Moonlight Basin. It is such a special place! Many thanks for everything! Great time on our motorcycle tour! Used the house as a base, visited the park as well as other locations. Your house was great! Wow! Love this house! We had a great time. We even got to go to Yellowstone! Hope we can come back soon! We had such a great time hiking, kicking back, and enjoying the hot tub. Thank you for sharing this wonderful getaway with us!